Often called the gateway to Asia, at least for Americans, Singapore is surprisingly modern and westernized. They also speak English as their primary language. But amid the staggering skyscrapers and new age gardens is more history and culture than you can imagine in a country of such a small size. Located in southeast Asia, this island is just south of Malaysia and is increasing in size as I type. There are many “reclaimed land” projects going on where sand is being imported into the oceans to create new land and grow the city. In 1960, it was 225 square miles, and today it’s up to 277 with plans to add another 40 square miles by 2030! I, for one, had never heard of such possibilities outside of Dubai. Known for its shopping and architectural phenomenon, Singapore was high on my bucket list of places to visit. Sure, it is a costly country to visit, but having a local as a friend sure does help you figure out what is worth the time and money and what is not. This brings me to the reason for our visit. Our friend Derrick is from Singapore and recently moved back, making it the perfect place to vacation and spend time with our gracious host and friend. Derrick also acted as our local tour guide. He set this Singapore 3 day itinerary for us which hopefully will be useful for you as well. Day 1: Plan to spend at least half a day here. Surrounded by “Supertrees,” this new landmark was built in 2012, astoundingly on land that did not exist just a few years ago! 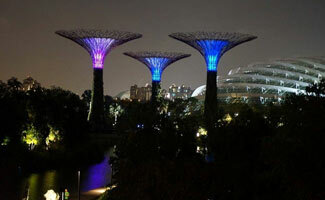 And, when you walk up to the Gardens by the Bay, it looks like more of an alien spaceship than a botanical garden. While you will enjoy walking around outside to see the interesting structures, landscaping and the view across the bay, you won’t want to miss what’s inside either. You can walk through the plant life of all the continents of the world. You will see more orchid varieties than you ever knew existed. And the sheer height of the waterfall and the architecture to get you from point A to point B in the building will blow your mind. The garden’s eco-friendly air-conditioning is a definite bonus for a hot Singapore day, especially as you are adjusting to the time change. If you’re hungry after hours of exploring this spaceship garden, there are a ton of delicious options in a pretty authentic food court area outside called Satay by the Bay. Day 1: Plan to spend a few hours. I recommend night city viewing. If you’ve done any research on Singapore, you’ve probably run across a picture of this spectacular building. It looks more like a ship on top of three skyscrapers than something you should trust to spend time touring. 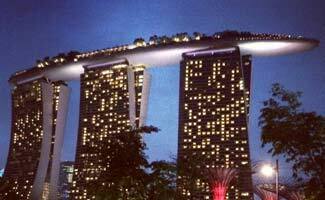 However, the Marina Bay Sands offers the best view of the city. The look comes at a pretty steep price, but when in Singapore… And if you want an even more exclusive experience, you could have dinner on top of the ship-like veranda and swim in the infinity pool. Or, maybe even stay at the hotel! Dare to dream! Day 2: Plan to spend most of the day here. 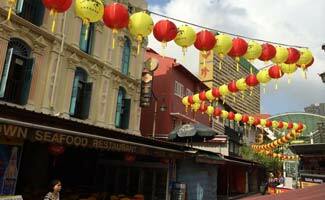 The country of Singapore finds its roots in its Chinese immigrants who set the cultural tone in past centuries. You can visit the communities and several of the buildings in which these people lived hundreds of years ago and, with the help of a local tour guide, come to understand the history of the city. Chinatown is the backbone of the city’s history, and this walking tour is one you cannot miss. In addition to the Buddhist and Hindu temples you will visit, you can also experience the inexpensive and authentic food in the open-air Hawker Centres. And don’t forget to pick up souvenirs while in this area – they are by far the cheapest you will find. Day 2: Go for a drink after your day in Chinatown. Day 3: Plan to spend at least half a day here. While Chinatown holds the oldest history of the city, Little India showcases a very different side of this country’s immigrant history. Many people from southern India also found their way to Singapore hundreds of years ago and formed a community that today is filled with rich culture and heritage. I would recommend arranging a walking tour of this area to make sure you don’t miss out on any of the beautiful temples, decadent markets, shopping opportunities, or tasty eating options. If you are looking for authentic Indian food, look no further than Komala Villas restaurant on Serandon Road. The prices are great, and the food is high-quality. 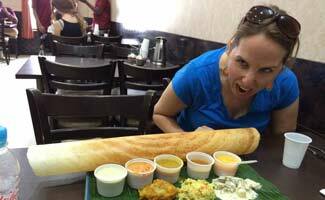 Be sure to order the Dosas – I am not sure I have ever seen such a beautifully presented yet massive food item. It is truly impressive and an experience you will not forget. Day 3: Plan to spend an evening here. If time allows, the Night Safari is something you may not get to experience in any other place on earth. And kids love it too! 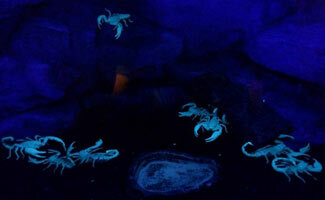 Founded in 1994, it was the world’s first nocturnal zoo. You start the tour of this zoo after dark with a performance that showcases several of the species you will find in the park. Then, you set out to come face-to-face with more than 2,000 species of night creatures across seven different geographical climates! You can take the tram or walk through the zoo. However, you will get to see a lot more animals if you take the time to stroll. For 11 years straight, it has won the Singapore Tourism Board’s award for Best Attraction in Singapore. Note: it is about a 40-minute cab drive to get there, so plan accordingly. So, this is just a sampling of the great attractions and culture that Singapore has to offer. This is also how we spent our three crazy days in Singapore. Whether you are looking for culture, theme parks, history, architecture, or just loads of fun, you will find it all here in Singapore. Which Singapore attraction do you most want to visit? Michelle has always wondered, what is our purpose on this planet? Why are we here? And in her exploration of these questions, she travels regularly all over the globe and is happiest when she is completely emerged in a completely unfamiliar culture. Among her bucket list locations are to visit Easter Island and hike the Incan trail at Machu Pichu. When not on the road, Michelle enjoys cooking, yoga, playing with her dogs and of course, writing. Singapore is a beautiful and interesting city (and expensive! ), we had a blast indeed. It’s known as the “entry-level” Asian city for new travelers, and we found this to be the case since everyone is fluent in English and it’s easy to get around. Be prepared to be monitored at every level (security cameras), and stay out of trouble (they’re laws are strict as Michelle mentions!) but in exchange you won’t have to be as concerned with crime as is typical for tourists in some other countries. Alex, thanks for sharing your experience, glad to hear you and Michelle enjoyed your time there and thanks for the extra tips!